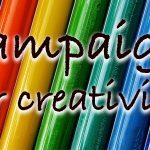 In this article we are going to take a look at crochet hooks. 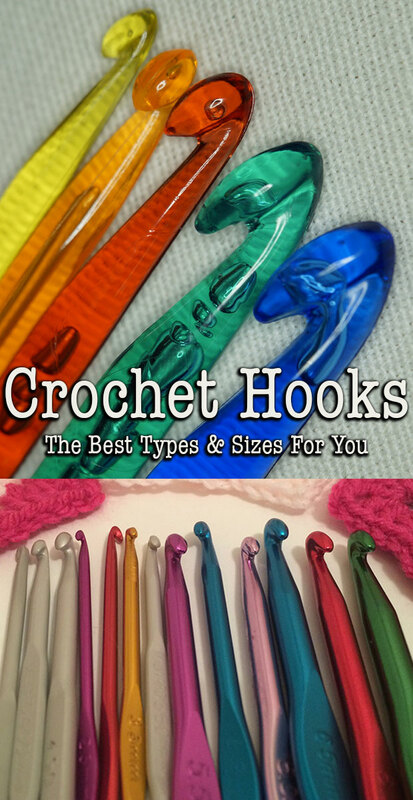 Giving you the information you need, to decide which is the right hook for your crochet project. 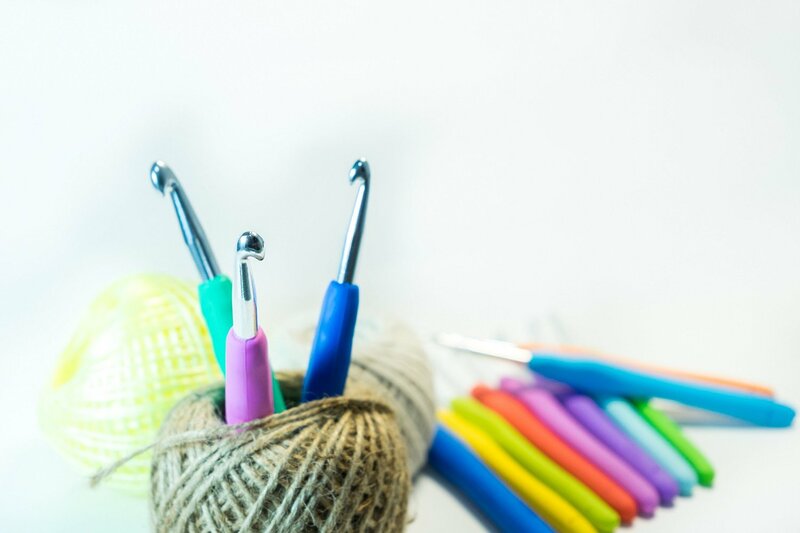 We will look at the different types of crochet hook you can buy. Including aluminium crochet hooks, steel crochet hooks, plastic crochet hooks, bamboo crochet hooks and ergonomic crochet hooks. I will then share my crochet hook size chart, to help you decide which crochet hook to use, depending upon the yarn type you have chosen. Finally, we will look at the best places to buy crochet hooks. Metal crochet hooks come in two general types, aluminium hooks and steel hooks. They can look pretty similar, but they serve slightly different purposes. Aluminium crochet hooks are very popular. 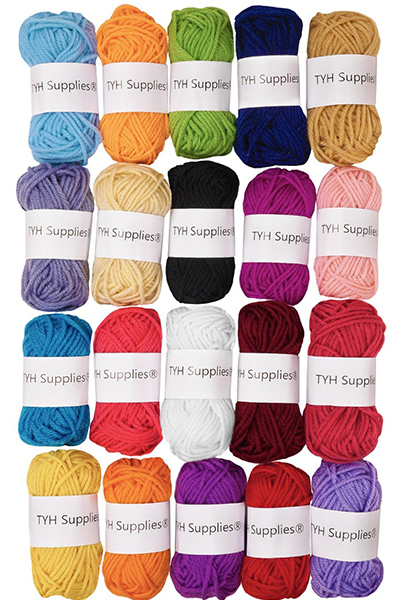 They come in sets, with a range of sizes, ideal for beginners to crochet and experienced crocheters alike. The are great all purpose crochet tools. The hook ends are normally slim and pointed, making it easy to grab and pick up threads of yarn. They are clearly marked and distinguishable from each other. They also have a flattened grip to help you manipulate them and move them around. I have several sets of aluminium crochet hooks, because they are so useful. I often have more than one project on the go at the same time, and I like to leave the hook in the ongoing project to ensure that I keep consistent stitch sizes. It is also easier to stay motivated in a project, if you can pick it straight up from where you have left it and start working again. 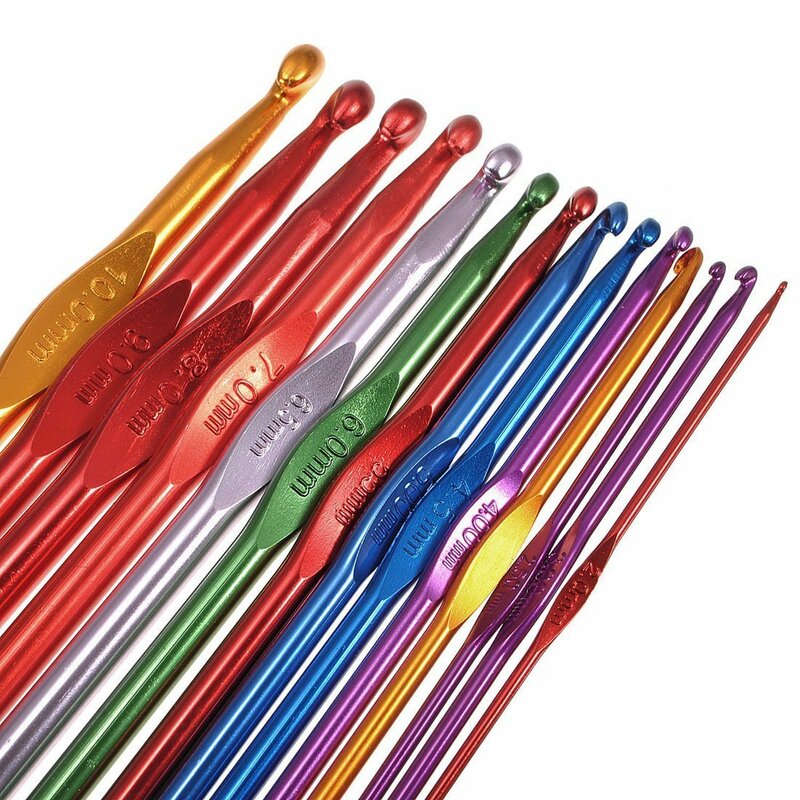 Aluminium crochet hooks tend to range in size between 2mm and 8mm, and are often supplied in a range of colours to help you to quickly spot the one that you require. Find Aluminium Crochet Hooks On Amazon Here. 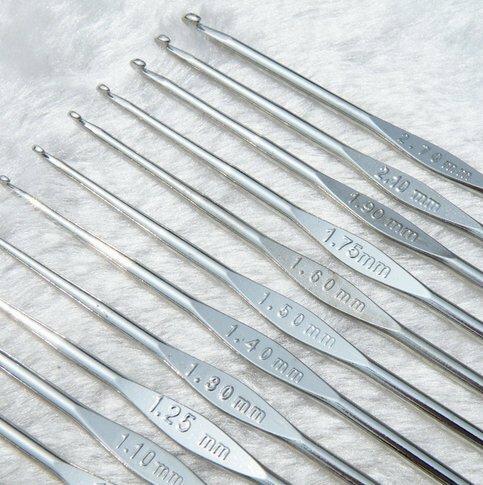 If you enjoy working on intricate lacework and tiny toys, then steel crochet hooks are the best choice when it comes to very small sizes. I have some very good quality steel crochet hooks that turn stitches very well. These were kindly given to me by a friend whose grandmother had passed them on to her. They are fantastic for use with very fine yarn weights, and insert into small spaces easily and gracefully. I also have a set which came in a pack, along with some more of those every useful aluminium crochet hooks. I believe it is this exact set of steel crochet hooks and aluminium crochet hooks that you can find on Amazon. Find Steel Crochet Hooks On Amazon Here. Plastic crochet hooks have an important place in my crochet kit. They have a different feel to the metal crochet hooks, and are often blunter. My only 9mm crochet hook is a plastic one, and it is very well weighted and workable for such a large size. I also have some fabulous slightly smaller plastic crochet hooks. They are even bright yellow in colour, which means I can find them easily when I inevitably leave them lying around the living room or tangled up in a ball of yarn. The only issue with some of the smaller plastic crochet hooks is that they can be a little fiddly to work with, as they have very small shafts. Find Plastic Crochet Hooks On Amazon Here. Ergonomic crochet hook ends can be made of a range of different materials. Usually plastic or aluminium, but sometimes steel in the hook section. The ergonomic part refers to the soft or adapted grip section, where you hold onto the crochet hook. I have a few different styles of ergonomic crochet hooks. The issue I have had with a couple of styles, is that the hook size is written on in ink. This rubs of after a few weeks of use, making it difficult to tell which hook size you are selecting. I recommend finding ergonomic crochet hooks with indented hook sizes, to make sure that this can’t happen. Rubber grips that are sculpted to fit neatly into your hand are not just easier to hold, they are less likely to give you blisters when working a tight stitched repetitive project. I find that I get less wrist pain using an ergonomic crochet hook, although this is of course just anecdotal! One downside to some soft grip crochet hooks, is that they cover a part of the hook end. This means that some styles will have a shorter hook to work with. Whilst this is not normally a problem, I have made some crochet patterns where I have needed to switch hooks, because it wouldn’t hold enough loops comfortably to work. For example, when using treble crocheting stitches together. 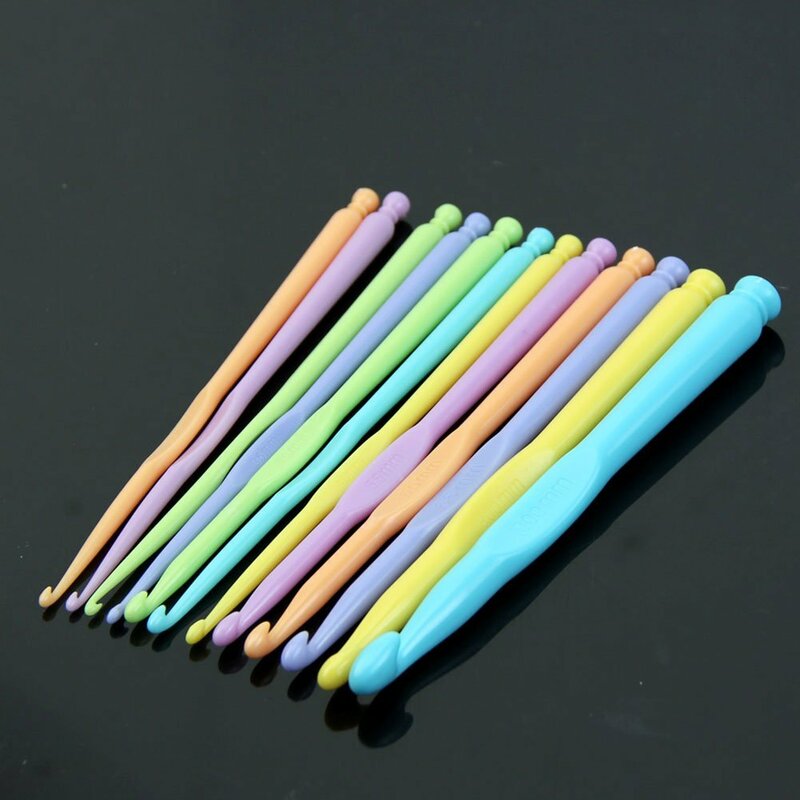 Find Ergonomic Crochet Hooks On Amazon Here. The final type of crochet hook I should mention is the bamboo crochet hook. I have owned a few types of bamboo crochet hook and I must admit that I have never got on well with them. I find that they are not as comfortable in my hand, and that they are generally quite blunt and wide at the hook end. This means that they do not as naturally allow you to lift the yarn or slide through a stitch. This isn’t a problem for looser stitched patterns, but could be a difficulty with smaller hook sizes. 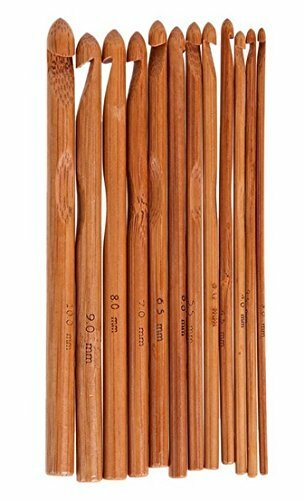 Find Bamboo Crochet Hooks On Amazon Here. The best crochet hooks will be ones which are the right size for the project you are making. They will have a hook which allows you to easily pick up stitches, but that doesn’t get stuck in the already worked yarn. Crochet hooks come in a range of sizes. From the tiniest models which can be less than a mm wide, to some seriously big and chunky ones. The hook you use can be decided by the pattern you are following. Patterns you have found online or paid for PDF copies of, will normally let you know the size of hook to use. But if you are making a pattern or creating something unique yourself, then you will have to work out the hook size on your own. If you are wondering where to buy crochet hooks, then you are in luck. There are a lot of options. I have found mine in a variety of locations. Local sewing shops often have a knitting and crochet section. It is worth snooping in local upholsteries, haberdasheries and of course specialist yarn shops. In the larger market, Hobby Lobby in the US or Hobby Craft in the UK also have a nice basic range. When shopping online, Amazon should probably be your first port of call. Let’s face it, they have most of our bank details, so ordering is really easy. 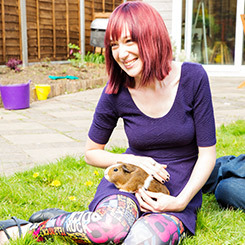 They also have a great range of sizes and types, and fantastic review functions to help you make the right decision.